Kodak EasyShare D830 Digital Picture Frame features 512 MB internal memory, 800×600 high-resolution picture display,. This digital photo frame also supports 2 slots— SD, SDHC, MMC, MS, MS PRO/MS PRO DUO, XD-Picture Card (xD) and USB Thumb Drives; Plays JPEG, EXIF media files. The Digital Picture Frame measures frame only: 24.9 × 19.8 × 3.3 cm (9.8 × 7.8 x 1.3 in.) (W x H x D) and weighs 843 g (1.9 lb. ). One digital frame. Hundreds of styles. 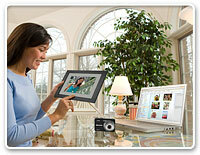 Show off your pictures and your style on a Kodak EasyShare décor Series Digital Frame. With its unique design, you can create a look that’s exclusively yours by pairing your digital frame with thousands of standard picture frames on the market, even a favorite you may already have. So enjoy beautiful pictures, stirring memories—all with your personal touch. * Stunning picture quality with the digital display that features proprietary Kodak Color Science technology for crisper detail and more vibrant colors. * With room to store up to 4,000 pictures* with 512 MB internal memory, you can keep your picture collection on your frame. Pictures are automatically resized to fit more on the frame. * The unique Quick Touch Border with automatic motion sensor lets you scroll through your photos, edit and more—right on the frame. * Plug-and-play—just insert your memory card or USB flash drive with your digital pictures and your slide show automatically begins. * See more memories at once using the dynamic collage mode that shows off several pictures at the same time. Simply push the mode button to choose other options, including clock and calendar views. * Sync with the pictures on your computer and create your own slide shows with the optional Kodak EasyShare digital Display Software. * Give a frame as a personalized gift by including a memory card with your own pictures to get the show started. * Mount your frame on a wall or display on a table, anywhere in your home. * Powered by an ENERGY STAR Qualified Adapter for a better environment. This entry was posted on Monday, April 9th, 2012 at 3:00 pm and is filed under Digital Frames. You can follow any responses to this entry through the RSS 2.0 feed. You can skip to the end and leave a response. Pinging is currently not allowed.